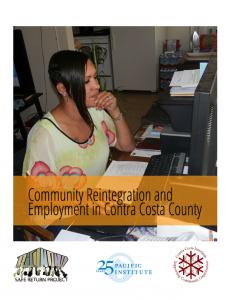 The Safe Return Project – a participatory action research process in Richmond, California involving formerly incarcerated residents in carrying out research and organizing to increase opportunities for community reintegration – released the report Employment and Community Reintegration in Contra Costa County. The publication, produced in collaboration with the Pacific Institute and CCISCO, presents original research, including survey findings that 78% of formerly incarcerated Richmond residents are unemployed, and two out of three have not held a single job since their release. The research report finds a high level of interest in job training and transitional employment among the formerly incarcerated: while only 30% of respondents said they had participated in a trade or job training program after their release, more than 3 in 4 of those who did not participate were interested in such a program. The financial hardship of unemployment was evident in that more than half of those surveyed stated they had often or sometimes skipped a meal due to difficulties getting food. The majority also reported they had wanted to see a doctor, but did not because of the cost. On July 30, 2013, the Richmond City Council took an historic step in leveling the playing field for returning citizens in passing an ordinance that expands their “Fairness in Hiring” policy to include all companies doing business with the City of Richmond. A broad cross-section of clergy, formerly incarcerated community leaders from the Safe Return Project, public officials, and business owners held a press conference on the steps of the Richmond City Hall to declare their support for the legislation. Richmond City Council member Jovanka Beckles introduced the legislation in response to the 78% unemployment rate for Richmond residents who have returned home from incarceration. The City of Richmond and 43 other cities and states across the U.S. have decided that in their hiring they will not consider applicants’ past convictions unless legally required and only after the person has found to be qualified for the position. The Federal Equal Employment Opportunity Commission endorses this as a best practice and many county governments have found that it reduces costs in addition to improving public safety. “Sensitive positions” would be excluded from this provision and would be allowed to conduct background checks during the hiring process. Contra Costa County has led the way around issues of reentry and realignment in the state of California as the county shifted over $5 million dollars away from a jail expansion and into investments in people coming home from prison (click here for the history of this campaign).